Satellite-based sensors that detect chlorophyll can give a bird’s-eye view of the extent and growth of algae blooms over wide swaths of water. Scientists are increasingly turning to those tools to calculate the amount of algae across entire lakes — as long as it isn’t cloudy. The Landsat series of Earth-observing satellites operated by the U.S. Geological Survey and NASA produces imagery that has been used to calculate chlorophyll concentrations lakes and reservoirs, but the sensors can’t penetrate cloud cover. 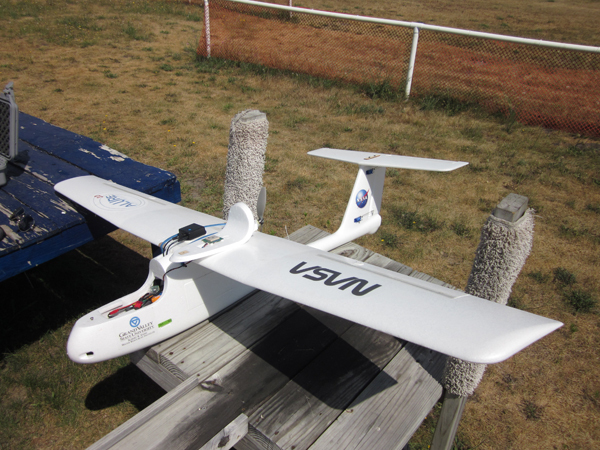 Researchers at Grand Valley State University’s Annis Water Resources Institute are pioneering an inexpensive way to stay beneath the clouds while collecting similar data by attaching a sensor emulating Landsat instruments to a foam aircraft with a five-and-a-half-foot wingspan. The Annis Water Resources Institute sits on the shore of Muskegon Lake, a drowned river mouth in West Michigan where blue green algae has previously been detected. In the summer of 2013, Associate Research Scientist John Koches and a student intern tested the aircraft’s ability to carry a near-infrared sensor over Muskegon Lake while automatically following a preset route. The plane has a hobby-class remote control radio that can be manually piloted from the ground and any time, but each mission for this application was flown almost entirely using an open-source autopilot system based on an Arduino microprocessor. The system is detailed on the website DIY Drones. Koches and intern Alexander Ebenstein equipped the aircraft with a TetraCam ADC, a 7-ounce, palm-sized camera that approximates three bands from the Landsat 7 satellite’s Thematic Mapper sensor, including one that detects the near-infrared range. “Chlorophyll reflects near infrared wavelengths, so the more chlorophyll the more near infrared that is detected by the sensor and it shows up as bright red or pink in a color-adjusted image,” Koches said. Chlorophyll concentrations are estimated by comparing numbers associated with the images with in-situ chlorophyll measurements from a YSI 6600 V2 sonde. Koches said some challenges arose during their tests, including issues with processing the images and calibrating the camera and its onboard GPS system. But those problems were resolved as the summer progressed and they gained experience. Difficulties with the two Landsat satellites currently capturing images from orbit were harder to overcome. Most of the other obstacles were related to gathering the in-situ measurements. Setting up and trailering the boat, organizing safety equipment and calibrating the YSI sonde were more time-consuming than the flight operations, Koches said. The perils of field work are among the reasons that he says unmanned aerial vehicles have a bright future in environmental research. “In my opinion it is much safer standing on land watching the aircraft do its thing rather than climbing in and out of a small boat carrying all kinds of gear,” he said. UAV systems also have great potential beyond open-water research and could be valuable tools for researchers exploring nearshore habitats, wetlands, forest management, and threatened and endangered species. “Clearly, the UAV has its advantages,” Koches said.